"Living only for the moment, turning our full attention to the pleasures of the moon, the snow, the cherry blossoms, and the maple leaves; singing songs, drinking wine, diverting ourselves in just floating, floating; caring not a whit for the pauperism staring us in the face, refusing to be disheartened, like a gourd floating along the river current; this is what we call the floating world." During the Edo Period (1615-1868), there existed schools of art favoured by the high classes. In Edo, the samurai (i.e. the political ruling class, lead by the shogun) were patrons of the Kanō school of painting. In Kyoto, seat of the imperial court, they favoured the yamato-e style of painting, which had a long tradition in Japanese art. During the 17th century, though, these two 'official' schools became conservative, giving way to the birth of various new art forms. Among them were bunjin-ga, shasei-ga, yōfū-ga, and ukiyo-e.
Ukiyo-e means 'pictures of the floating world', and is associated with Buddhist principles regarding the ephemerality of human existence. This new form of painting, produced in series of prints, set out to reflect this floating, fleeting world through the hedonistic preoccupations of urban life, mainly scenes depicting the courtesans and kabuki actors of Edo’s 'pleasure districts'. From the very beginning, ukiyo-e was aimed at common townspeople. Although woodblock printing had a very long tradition in Japanese art (it is perhaps the oldest in the world), it did not reach popular culture until the 17th century, with the illustrations of popular novels, named tanroku-bon. Its style, though, imitated that of the elegant yamato-e painting. With a new literary genre, kanazōshi, the style of the illustrations evolved into one that prefigured the future ukiyo-e. These would gain great popularity, and soon a more refined public began to offer commissions to famous ukiyo-e artists and craftsmen. In 1765, new technology made it possible to produce prints in colour. Whereas before they were monochrome and then painted by hand, now single-sheet prints could be made in a whole range of colours. These technological developments encouraged artists to pursue the limits of the woodblock print’s potential, making the ukiyo-e style a powerful means of creative expression. It was also a collaborative form of art, as each print required the joint efforts of the designer, the engraver, the printer, and the publisher. The artist makes a preliminary drawing and a more accurate copy from which the print will be taken. After being submitted to the censor for approval, the drawing is passed to the woodcarver, who sticks it to the woodblock face down and carves it in relief. Prints will be made from this carved woodblock in black ink. Later, the painter decides on the colours to be added to the various impressions in black. Following the artist’s instructions, the woodcarver makes the blocks for the colour prints. Once the first colour prints are produced, they are shown to the artist and the publisher for their approval and possible corrections. Afterwards, the definitive print is made. It is interesting to note that the publisher supervises this whole process, as he holds all the rights over the prints that are produced. Thirty-Six Views of Mount Fuji was a seminal series of prints, not only for its aesthetic quality, but also for its theme. The whole series – as its title announces – revolves around Mount Fuji. This 3,776-metre-high volcano, visible from Edo on clear days, had been a classical source of inspiration for poets and painters. In his beautiful depictions of the mountain – in truth forty-six, not the thirty-six stated in the title – Hokusai created a balance between traditional Japanese painting and Western influences. Before Hokusai’s take on this subject, landscapes appeared in prints as a mere background for people, mostly actors or fashionable women. Prints of pure landscape did exist, but they were scarce and not considered a genre per se. To produce a whole series of large-scale landscapes was therefore anything but a safe bet by Hokusai and his editor. As it turned out, it was to prove a true landmark in the history of Japanese prints. This series consists of eight different views of famous waterfalls from various Japanese provinces. 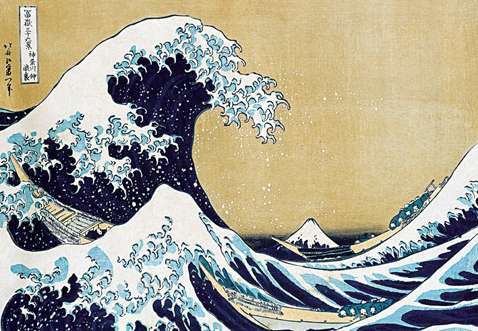 It is unknown why Hokusai chose this theme, but it was the first series dedicated exclusively to it. More than anything, it seems to have provided the artist with a motif on which to try out different aesthetic possibilities. Some waterfalls pour down solidly whereas others are broken up. Despite being inspired by views of nature, no doubt the compositions have a great deal of Hokusai’s imaginative input, giving birth to a very attractive series which, in contrast to Thirty-Six-Views, shows little Western influence. 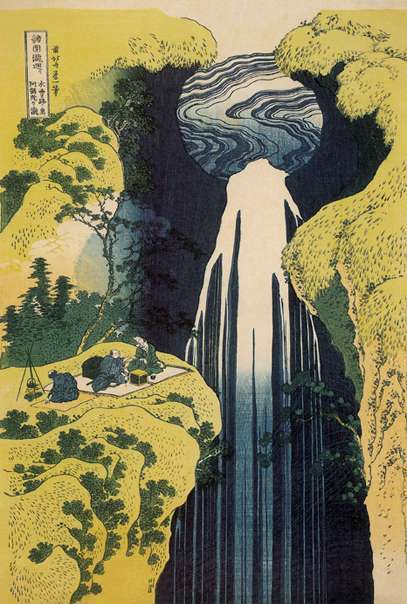 Waterfalls of Japan (Shokoku taki meguri), 1834-1835. Honolulu Museum of Art, Honolulu. Whereas Thirty-Six Views of Mount Fuji was a commercial success, Mirror of Chinese and Japanese Poems was aimed specifically at a cultured elite, and intended for limited circulation. The series consists of ten designs, in each of which a classical poet appears before a landscape. These landscapes represent places associated with the poet or sceneries that appeared in their poems. The allusions would not always have been clear to the wider public, and this explains their appeal to a limited, more educated audience and the rarity of the series in comparison to other more popular ones. The aesthetic achievements of these prints lie mainly in their well-balanced combination of colours and the gradation of the tones, which probably seemed very new at the time. This, along with the comparatively scarce number of examples of this series, makes it a favourite among scholars. Nagaban, nishiki-e (polychrome woodblock print), 52.1 x 23.2 cm. It is widely acknowledged that One Hundred Views of Mount Fuji is Hokusai’s masterpiece in book illustration. The three volumes that make up the series were a foremost example of lavish production, cut by the best wood cutters of the time and printed in black and shades of grey. These illustrations show Hokusai’s great creative powers through a series of original compositions based, once again, on Mount Fuji. 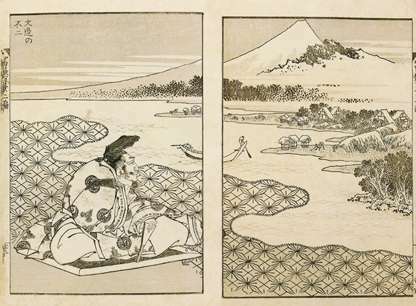 Hokusai included a short autobiography at the end of the first volume, which proves that he saw this new series as a decisive moment in his career. This is further demonstrated in the fact that he signed it with a new name, zen Hokusai I-itsu aratame gakyorōjin Manji ("the former Hokusai I-itsu changing into gakyorōjin Manji"). As if his great works did not express it clearly enough, gakyorōjin means 'the old man mad with drawing'. of Mount Fuji (Fugaku hyakkei), c. 1834-1835. Sumizuri-e (monochrome woodblock print), 18.8 x 25.3 cm.